Update 2. 9/9/15: 25cm (about 10 inches) of rain in 48 hours across Tokyo. Four typhoons in the space of two weeks. It's a little wet here at the moment. 120,000 evacuated in Hamamatsu, a city on the Pacific coast between Tokyo and Nagoya. Second one coming for Japan tomorrow or the day after. Update: And now, two weeks later, we have three hurricanes in the East Pacific, at one point all reaching category 4 at the same time. Something of a first. We're enjoying quiet an El Nino this year. Typhoons are relatively common at this time of year; in fact we're in the middle of the season, so somewhat to be expected. 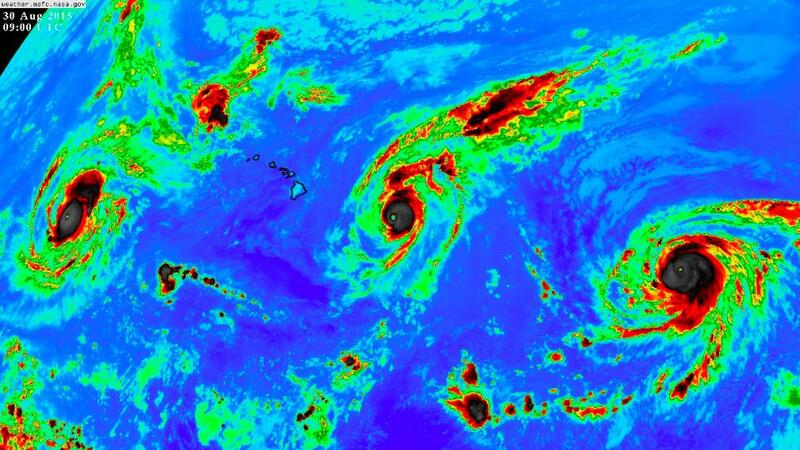 What is not so common are twin typhoons approaching across the Pacific which is the case today. 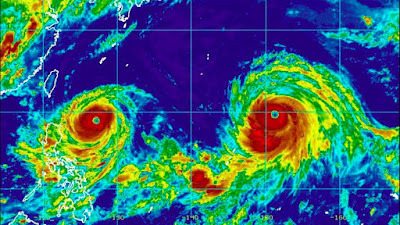 This time we'll dodge a bullet in Japan, which can't be said for the battered people in Taiwan as one will veer west and hit them, the other will veer north and skim the east coast but without actual landfall. At least that's the current forecast. Going to get wet though. Two years ago, in October 2013, that wasn't quite the case as a twin typhoon formation made a direct hit on the Miura Peninsula to the south of Tokyo. As they approached the coast they merged to form a single system, winds relatively unchanged but the water they carried significantly increased. It's estimated that the energy released by a single typhoon is equivalent to the power consumption of Japan. Over an eight year period. So a pairing is not to be taken lightly. And on that very same day in October 2013, a friend had planned to marry his beautiful Japanese bride in the ancient capital of Kamakura, pretty much Ground Zero. We knew the transport systems would be down and road travel dangerous. It simply wouldn't be safe for the guests, the staff or the happy couple so it had to be postponed for two days. But after a typhoon comes incredible blue skies and calm seas. And if you're going to get married, try timing for after a double one. What a beautiful day.